Follows Fujii, a high school student who is love with Enomoto Fumiho. He lives in a world where people are touched by a rare "illness" called the Biorg Bug. One day Fujii catches the bug which makes holes in the shape of hearts on his hands. What will happen to him now? 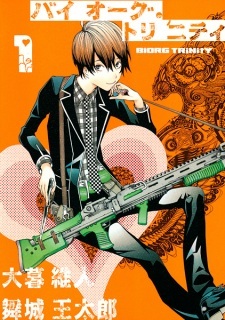 Biorg Trinity has been published in Italian by Panini Comics under the Planet Manga imprint since November 8, 2014, and in French by Kazé Manga since March 26, 2014. The first few chapters will be super crazy and the chances of understanding anything are very slim until later on. The plot will soon pick up after a few of the first chapter's when things start getting serious. The art I feel is one of the best qualities of Biorg Trinity. You'll never get tired of looking at each panel. Side stories seem to be common as well as something craziness in each chapter that will force you to say "What the..." If you want to read something that's easy to understand I would suggest not to start with this one. However, if you came with an opened mind and want some entertainment then go right ahead.